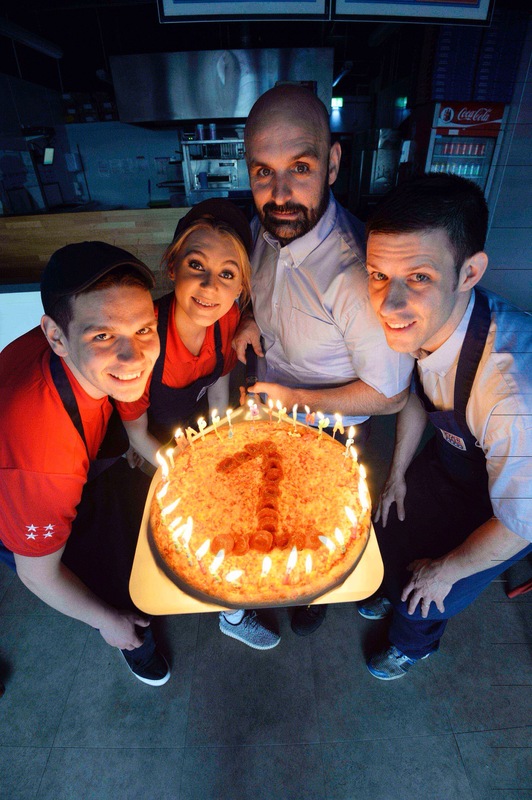 PIZZA lovers in Carrick will be joining in the ‘party’ this week as the town’s popular Four Star Pizza restaurant celebrates its first birthday. The store officially opened its doors on Marine Highway in September 2015 as part of a £150,000 investment which has created 20 jobs in the area. 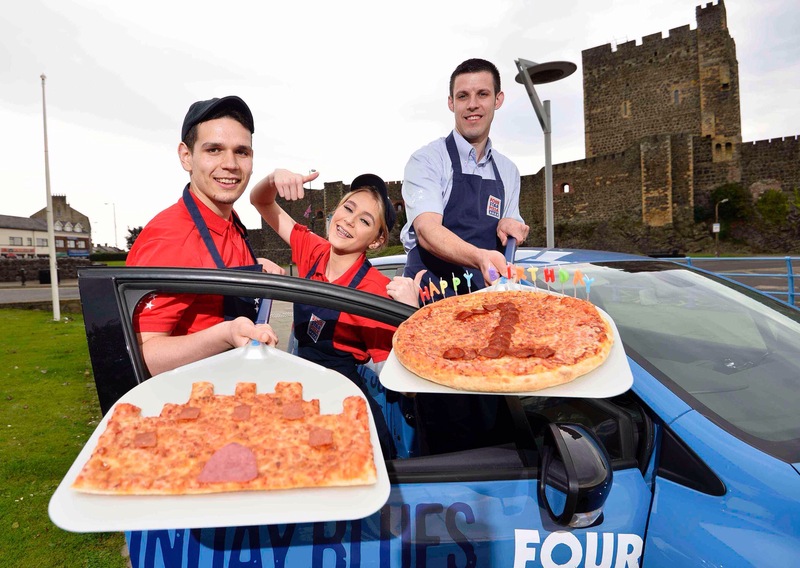 Since then, it has delivered no fewer than 75,000 FRESH PIZZAS to homes in the Carrick area, using OVER ONE MILLION pepperoni slices, 10 TONNES of cheese and 17 TONNES of flour. And to mark the occasion, from Monday September 12 to Sunday September 20, every customer who buys a 12” or 14” pizza will receive another one – ABSOLUTELY FREE! Owners Scott and Jamie Higginson from Greenisland, who now own a total of six Four Star Pizza stores in Northern Ireland, are delighted with the success of the Carrick store which also has a ‘sit-in’ option that can cater for up to 30 customers on-site. “We’ve lived in Greenisland for the past 10 years and always wanted to bring Four Star Pizza to the area but just couldn’t find the right location,” said Scott. “So when the perfect location became available on Marine Highway and we did not hesitate to snap it up! “We couldn’t be happier with how things have gone in our first year – which has been the most successful opening of any of our six existing stores in Northern Ireland. It’s been a busy year with many highlights which have included winning the Best New Store Award at the annual Four Star Pizza Awards in March, as well as creating 60 pirate-ship shaped pizzas for a local primary school fun day. And more recently, the appearance of comedy duo ‘Chad and Courtney’ (aka Shane Todd and Colin Geddis) to help celebrate Independence Day on July 4. The store has also supported a number of local charity and community initiatives during the year including Autism NI Carrickfergus, Carrick Ladies RFC, the East Antrim Marathon Series, Greenisland Primary School, Sports Changes Life and many more. Customers wanting to join in the party and claim a ‘buy one get one free’ pizza from the Carrick store can order a delivery on 028 9335 1489, online at http://www.fourstarpizza.co.uk or via the Four Star Pizza app. Alternatively, visit the store and enjoy your pizzas in the sit-in area. Scott and Jamie Higginson are directors of Doughboys Ltd which comprises of six Four Star Pizza stores in Belfast, Newtownabbey and Carrick. They opened Northern Ireland’s first Four Star Pizza store in 1999 on Belfast’s Beersbridge Road. Four Star Pizza is an Irish-owned Pizza chain, first established in 1988, which operates 40 stores across the island of Ireland, specialising in creating fresh, delicious pizza and delivering it straight to your door. Four Star pizzas are renowned for their pizza dough which is freshly prepared by hand on site daily by passionate and expertly trained pizza chefs, using top quality locally sourced flour.